Knocking Dams Down & Lifting Fish Up! Is this aging Kinneytown Dam with its ineffective fish ladder the last barrier to fish passage? 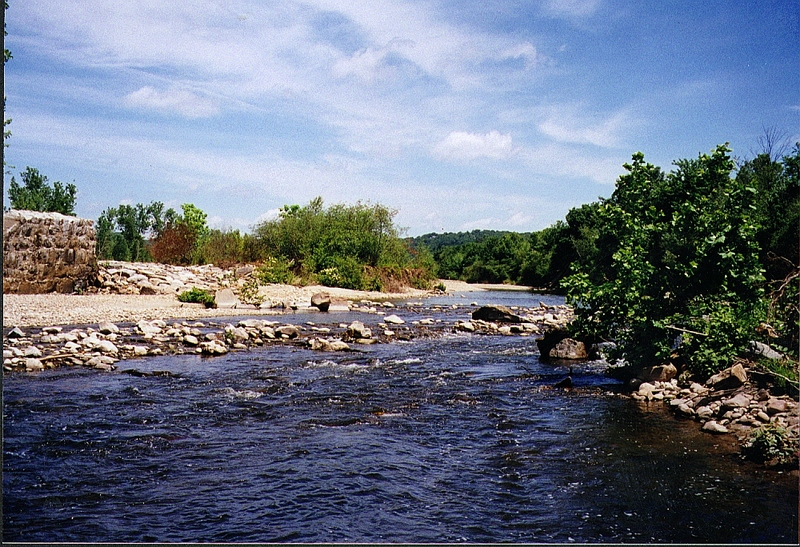 The Tingue Dam, in the video below, is approximately 1 mile up river from the Kinneytown Dam and is no longer be a barrier to the migration of fish to the upper Naugatuck River. 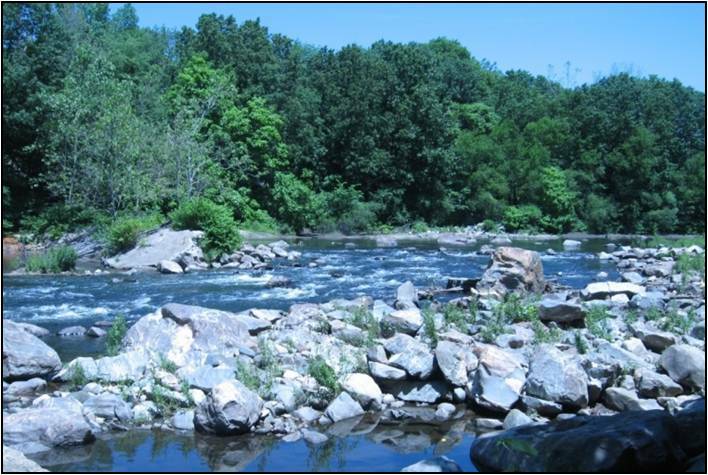 American Rivers, in collaboration with a number of partners, offers Taking a Second Look: Communities and Dam Removal. This 22-minute video is meant to inform dam owners, local businesses, public officials, resource agencies, and other concerned community members about the benefits of dam removal as a river restoration tool. 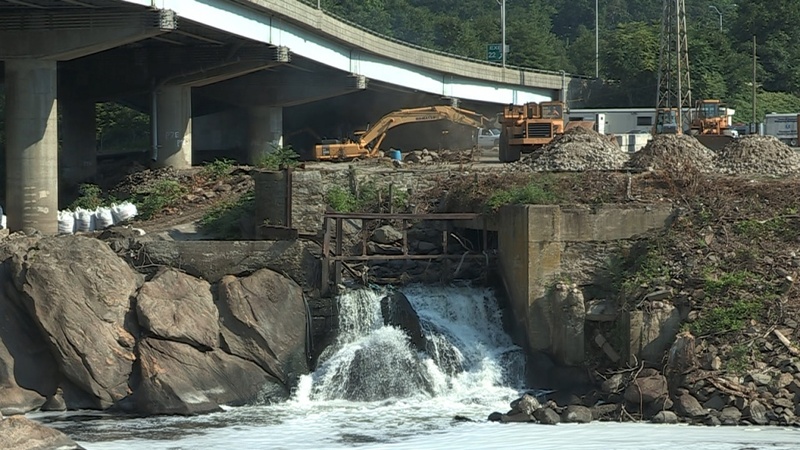 Featuring case studies of communities that have removed dams in Wisconsin, Maine, and California, the video addresses many of the issues and concerns that are involved in the process of deciding whether or not to remove a dam. To view this video click here. Installation of a fish ladder on the Tingue Dam in Seymour has opened 32 free-flowing miles of the river to anadromous fish migration for the first time since 1763. Pictured above is the artist rendering of the Tingue Dam Bypass Channel in the process of being built as of December 2013 and expected to be completed in 2014.The dotted line represents Rt. 8 heading north to the right. The Channel runs top right just below Rt. 8 through the center of rendering. The old Tingue Dam is 152 feet long and represented left-center as irregular rock structure. Flow of water is right to left. It is approximately 500 feet long. A beautiful tree lined park is pictured along the Bypass. 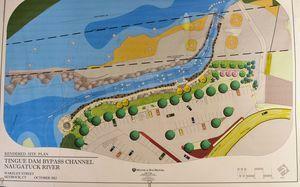 A non-accessible island will be created under Rt8 across from the viewing park. Fish leaping into the Tingue Dam a month before start of construction. The second cofferdam is being built and pictured in the center of the photo. It is a temporary dam to keep the river from the work area. It is making its way back in a loop towards the base of the Tingue Dam. The first cofferdam can be seen as white sand bags left center of photo. This is a photo of the abandoned intake structure that found a use as a catch basin for shopping carts, tires and other debris for decades until its last days. The white sand bags (middle left) are placed tightly together creating the first cofferdam. This was one of the first steps to cut off the river from the old abandoned intake so it can removed. In the December 4th photo above the 2 cofferdam’s do their job well as the site quickly developes into the Bypass Channel it will become. The Tingue Dam is a run-of-the-river dam. It has a central stone masonry spillway, concrete spillway and intake structure constructed on irregular ledge. The 152 foot stone spillway varies in height from five to 20 feet, averaging approximately 14 feet high. On the southwestern end of the dam is a 57 foot wide section of natural ledge spillway that varies in elevation, but has a maximum of three feet lower than the crest of the stone masonry spillway. To the northeast of the central stone masonry spillway the crest of the dam turns 90° to the east along a small section of exposed ledge. The crest of the dam than continues along a 26 foot long reinforced concrete wall. Directly to the east of this wall is an abandoned factory intake structure. 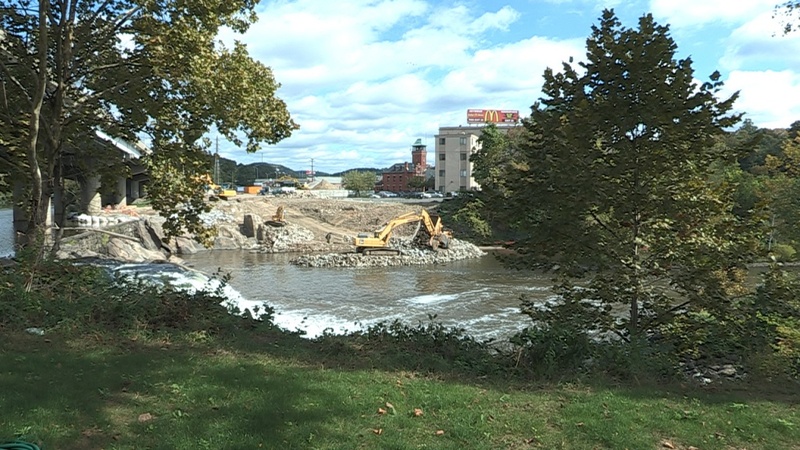 The factory that utilized the water impounded by this dam has been demolished and replaced with a paved parking lot. It was constructed circa 1763 (1803) to 1955. 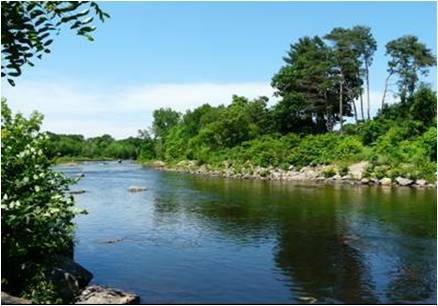 The New Haven Copper Company owns riparian rights, contingent on their use. State of Connecticut owns the land on which the dam is located. It is considered unused and abandoned. The Tingue Dam provided power and process water to a small but significant 18th and 19th century industrial complex. In the the late 1700’s the site provided power for a grist-mill, sawmill, woolen and cotton mills. In the last quarter of the 19th century, Tingue Manufacturing Company used the water impoundment by the dam for generating power and for scouring, bleaching and dyeing woolens. Water power was used by G. French (railroad) Car Spring factory, William Smith’s Machine Shop and the Excelsior Staple Company. The U.S. Pin Company used water power as did The Norman Sperry Auger Manufactory. The New Haven Copper Company used both water power and process water for refining, stamping and rolling copper and brass products. The site is significant as it is an unusual example of intensive development and full use of water resources on a small site for manufacturing. 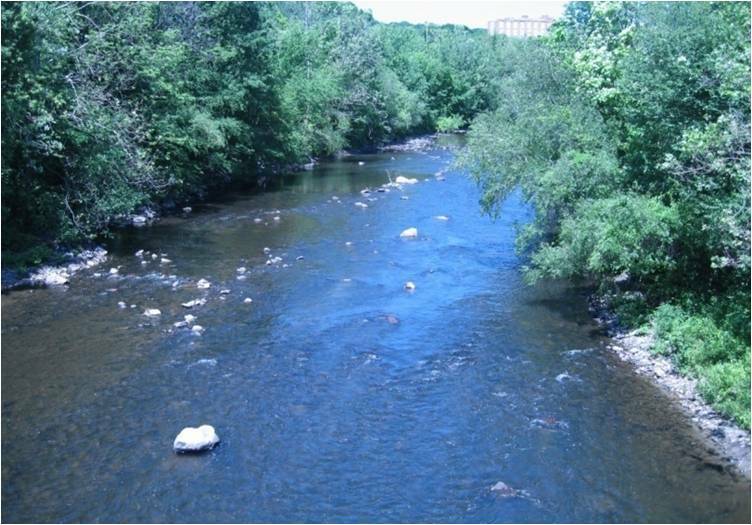 The Naugatuck historically supported migratory fish runs, including sea-run brown trout, American shad, alewife, and blueback herring. 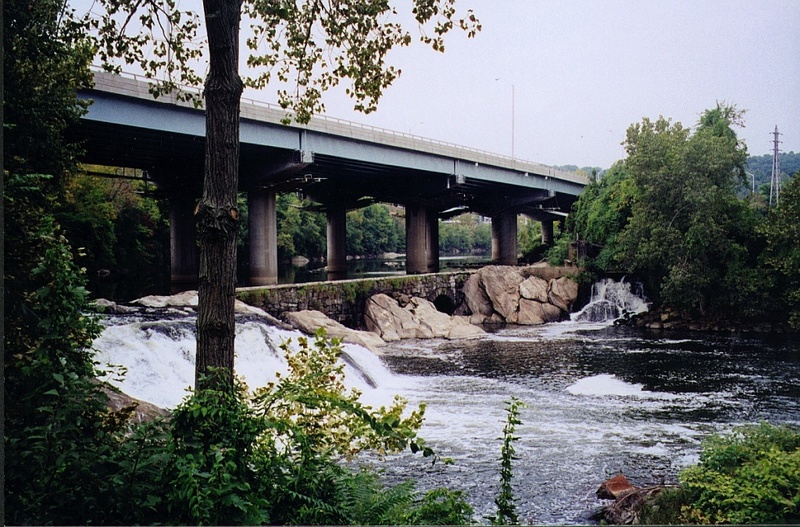 However, conditions started to deteriorate during the late 1700s, when the Naugatuck became one of the first rivers in Connecticut to be harnessed by dams. Dam construction continued during the industrial revolution of the 1800s. The dams provided power, cooling water, rinse water, and boiler water for industries, including brass and rubber manufacturing. These industries and the municipalities that grew up around them discharged untreated wastewater into the river. The fisheries were decimated. When the industrial boom ended, many businesses relocated or closed, leaving only the obsolete dams behind. Today the structures serve no flood control, hydropower or other economic purpose, and one by one the dams are coming down to restore the river back to its past, free-flowing state. The Anaconda Dam (Waterbury), Freight Street Dam (Waterbury), and Union City Dam (Naugatuck) were completely dismantled and removed in 1999. That same year, the Platts Mill Dam (Naugatuck) was breached and completely removed. The Anaconda Dam, an 11-foot high by 330-foot long dam, was the first large dam along the Naugatuck River to be removed. In 1999, a breach due to high water and ice led to an emergency removal to prevent flood waters from damaging the city’s exposed sewer line. Photo courtesy L. Wildman/Milone & MacBroom. The site of the former Anaconda Dam in Waterbury. The site of the former Union City Dam. The site of the former Freight Street Dam in Waterbury. The site of the former Platts Mill Dam in Waterbury. The Chase Brass Dam, a 4-foot high by 100-foot long dam, located between the former Anaconda Dam and the Plume & Atwood Dam, was the next dam to be taken down. 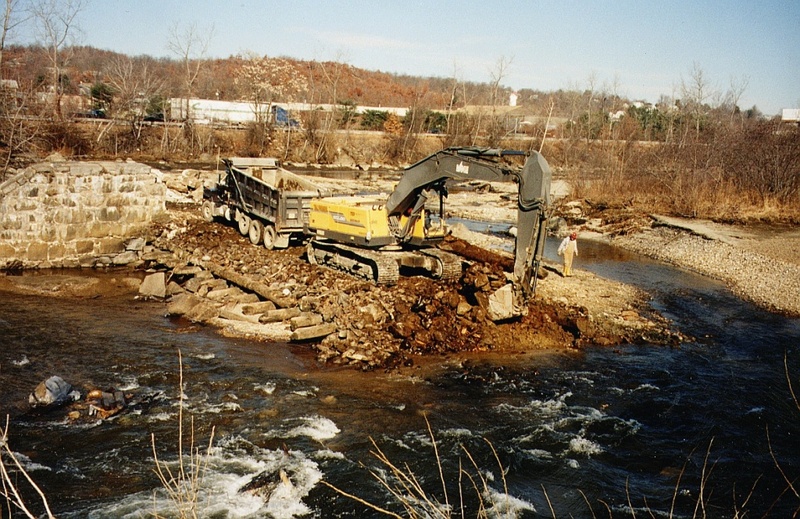 The dam was removed to bedrock in August 2004 to provide access to historic spawning habitat for several migratory fish species and improve water quality. The dam was built around the turn of the century to provide water to a nearby brass mill, but had been left unmaintained and presented a barrier to fish passage as well as a liability concern. Today, only the Plume and Atwood Dam in Thomaston, and the Tingue Dam in Seymour remain standing on the river. Plans are underway to construct a bypass channel at the Tingue Dam, which would provide migratory fish access to an additional 24 miles of river. 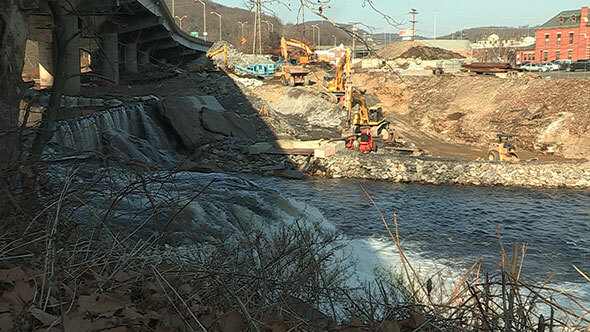 While no plans are currently underway, the Plume and Atwood Dam is targeted for eventual removal, providing fish access once again to the full length of the Naugatuck River.